If you're looking for an easy, reheatable dish that you can dress up for company or down for weekday breakfasts, look no further than quiche. 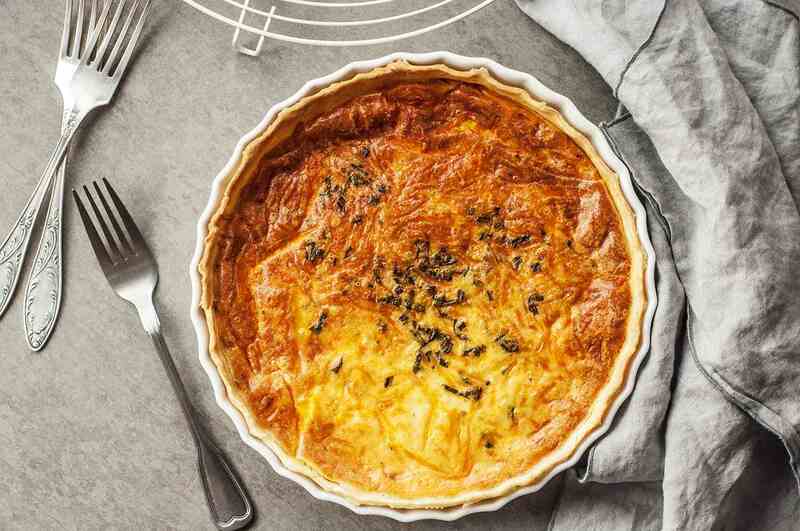 Despite the French name, quiche is simply an egg custard, seasoned with pretty much anything, baked in a flaky crust (although there are delicious crustless versions, too! They're the perfect way to use up leftover veggies, meat, and herbs, since there are few breakfast dishes more versatile than the quiche. For best results, use fresh, well-beaten eggs, and drain both veggies and meat thoroughly before adding, to avoid extra grease or a watery end product. Keep a few refrigerated pie crusts on hand, for last-minute assembly. Grease the pan well if you're going crust-free and even the first slice will come right out without a problem. Try these easy and delightful recipes, and feel free to experiment too! Got 10 minutes? Then you've got time to make this super-simple quiche. You can have this easy-as-pie cheese quiche on the table in about 10 minutes. Use a refrigerated pie crust and just five more ingredients for a fluffy and cheesy quiche that's perfect for breakfast, lunch, or a light dinner. Use whichever cheeses you have on hand, for a customized flavor. When you have to feed a crowd, this fabulous recipe stretches a pound of ground beef to serve eight to 10 people. It's rich, cheesy, delicious and easy to make! Spice things up a bit by adding minced jalapeño or habanero peppers to the onion and beef, or stir in some chili powder and cumin for a south-of-the-border sensibility. It also reheats well in the toaster or microwave, so don't fret if you end up with leftovers. Ham and Swiss are a natural match, and one of the best classic quiche combinations. A little honey mustard, thyme, and frozen chopped spinach add flavor and color to this traditional recipe. If you don't like the slightly funky scent of Swiss, try Gruyère or Havarti, instead. Add chopped broccoli, asparagus, or even green beens if you want to pump up the veggie quotient, too. Quiche Lorraine is one of the most traditional quiche recipes, made with crispy crumbled bacon and creamy shredded cheese. Don't let the fancy name fool you; it's easy as can be. Mix things up by substituting sausage or ham for the bacon and using any kind of cheese you've got on hand. This quiche tastes great as a light dinner with a crisp green salad and a glass of chilled white wine. Make these bite-sized quiches for a holiday appetizer or a quick grab-and-go breakfast or lunch. They're great for meals on the run because they're portable and taste just as good cold as warm. Best of all, they freeze well so you can whip up a batch on a quiet Sunday and have them ready to roll whenever you need them. The umami msurhoosm in this recipe are a lovely vegetarian version, but you can also use ham or prosciutto, bacon, sausage, or even chopped chicken if you'd like a little meat. Most quiche recipes call for lots of fat and cholesterol-laden cheese and meats, but you can make them diet-friendly, too. Go crustless for a gluten-free version, too. Depending on your individual diet restrictions, turn to soy milk and dairy-free cheese, or substitute cow's products instead. The only limit is your imagination! Many quiche recipes call for Swiss, Gruyere or similar cheeses, but cheddar adds a sharper, gooey flavor that complements bacon perfectly. You'll think you're enjoying a bacon cheeseburger for brunch! While this recipe calls for a simple homemade pie crust, you can also use a prepared pastry crust to cut down on the time. Fresh thyme also works in place of the dried kind, and adds a more assertively herbal taste. Make it ahead for a quick breakfast or lunch. Not only does this hearty quiche recipe use a hearty dose of sausage and cheese, but boiled eggs layered right into it really pump up the protein. They also add an unexpected texture that your guests won't be expecting. Use any kinds of cheese you have on hand, and try spicy sausage or chorizo for a zippier flavor. Sautéed peppers and onions will add a different dimension, too. Chock-full of healthy broccoli, this deep-dish quiche will make sure you get your strive-for-five. Either store-bought or homemade pie crusts will work well. If you make your own, double the batch so you've got one on hand for next time. Mix up the flavor by adding additional vegetables, crumbled bacon, chopped ham, chicken, turkey, or crumbled sausage. If you use bacon or sausage, make sure you drain it well before adding, so your quiche doesn't get greasy. Don't be afraid to mix seafood with cheese in this simple crab and cheese quiche. Decadent crabmeat goes perfectly with Swiss cheese, while a little sautéed shallot and nutmeg deepens the flavor. Spring for real lump crabmeat for this one. Since it's the star of the show, the genuine article really makes a difference. Make the most of spring produce with this fresh-tasting asparagus and leek quiche. Tender shoots of grassy asparagus contrast beautifully with sweet, melty leeks in a recipe you'll want to make again and again. Sharp parmesan stands up well to the vegetables in this simple recipe, but havarti, chèvre, or a blend tastes great, too. If you've never used ramps before, get ready to meet your new favorite springtime vegetable in this rich and flavorful quiche. Ramps have a lovely, delicate onion-like flavor, but they can be hard to find outside their short season. Substitute 6-8 sliced green onions and a clove or two of garlic, if you can't get ramps. Diced tomatoes, crumbled bacon, and a blend of cheeses round it all out. Many of us don't think of squash for breakfast, but this butternut squash quiche will change your mind. Diced butternut squash add a vegetal sweetness, while sour cream and cheese level up the creamy richness. Roasted garlic and bitter Swiss chard add another dimension that's as hearty as it is comforting. Serve it with a salad for dinner or on its own for breakfast or brunch. 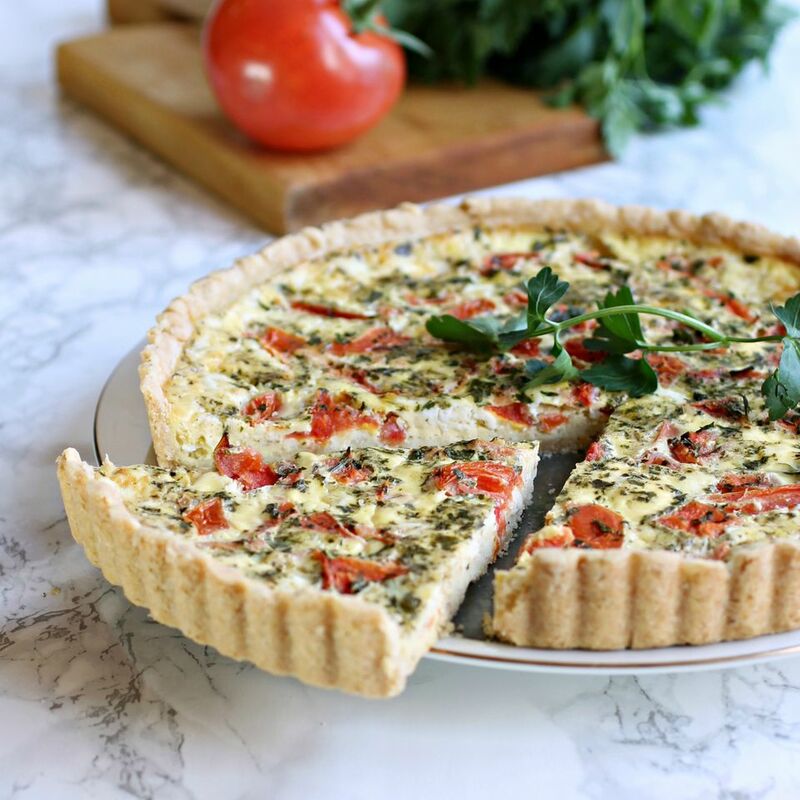 Enjoy Middle Eastern cuisine in a new way with this za'atar-scented tomato and feta quiche. Sharp, crumbly feta and sweet tomatoes are a beautiful combination, with a blend of spices that taste like sunshine. With notes of sumac, toasted sesame, thyme, marjoram, and and oregano, the za'atar spice mix will become your new go-to, if you haven't tried it yet. Yes, you can enjoy quiche even if you're avoiding animal products. This basic recipe uses silken tofu in place of the eggs, as well as onion, garlic, vegan bacon, and broccoli for tons of flavor and texture. Feel free to use whatever vegetables you have on hand, or add dairy-free cheese for additional creaminess. You'll never miss the eggs, with this recipe.